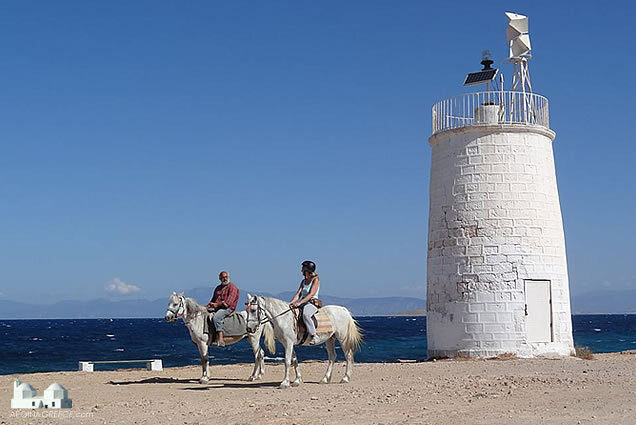 There are few better ways to explore the beauty of Aegina than on horse. The island's coastal and wooded areas provide the perfect backdrop for experiencing adventure with one of nature's most majestic creatures. The Aegina Workshop provides experienced guides to assist riders of all levels in a variety of activities including lessons in riding and stable maintenance as well as show jumping and games. Experienced riders can select from one twelve horses to ride within the organizations outdoor grounds or take a trail ride through the northern mountain paths. The workshops's stables are located next to the Alones valley situated above Agia Marina. Touring Aegina and enjoying its various landscapes proves that this island is much more than day trippers and pistachios. Deserted cities, ancient temples and neoclassical buildings whisper echoes of the past into your ears while its array of outdoor activities scream adventure. Whether you're looking for peace and quiet or endless excitement, Aegina never disappoints. The Aegina Workshop (Ergastiri tis Aeginas) provides experienced guides to assist riders of all levels in a variety of activities including lessons in riding and stable maintenance as well as show jumping and games. Experienced riders can select from one twelve horses to ride within the organizations outdoor grounds or take a trail ride through the northern mountain paths. The workshops's stables are located next to the Alones valley situated above Agia Marina. Perdika Horseriding in the town of Perdika also offers guided tours for riders of all ages and experience levels.